KE Creations -- KE Creations now has a temporally site, if it goes well, I will make an actual .com site later. The site is very 'new', and at the moment, you can only find blogs of my projects (seen in header screen). Please visit sometime! You can reply to many topics as guest already, but I would appreciate if your register later on. 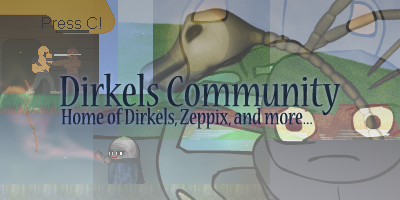 I will probably close the Dirkels Community soon, since this is actually the same concept, but now not only about Dirkels. KE Creations will have games, animations, art and music created by me. If you got suggestions or ideas, please PM me. Kyon E.